HTC's Desire line is known for being home for smartphones ranging from entry-level to the upper borders of the midrange, with some unique experimentation-grade devices (*ahem* EYE) sprinkled in at certain moments. So, when the company launched the paint-splattered Desire 530, 630, and 825, we got a bit curious what HTC would come up with when it comes time to launch a more “premium” Desire phone. Well, the HTC Desire 10 Lifestyle and HTC Desire 10 Pro are here and, in terms of striking, fresh looks — they do not disappoint! The two smartphones look very similar and most of their differences can only be found under the hood. However, the HTC Desire 10 Pro does sport a fingerprint scanner on its back, a dual-tone LED flash, and a laser autofocus module, all of which provide a clear visual differentiation between the handsets. All that said, however, we've got a pretty unique design from HTC here. A solid build with a bold, gold trim puts the phones in a whole separate category than the youthful-looking Desire 530 and its colorful comrades. The Desire 10 phones look like they've been built to be lifestyle items for people that take accessorizing seriously. There will be four colors available at launch — Stone Black, Polar White, Royal Blue, and Valentine Lux (light blue). Some users may find the look a bit off-putting or need time to get used to it, but we still applaud HTC for trying to do its own thing and be unique, even in times when it isn't doing so well in the sales department. 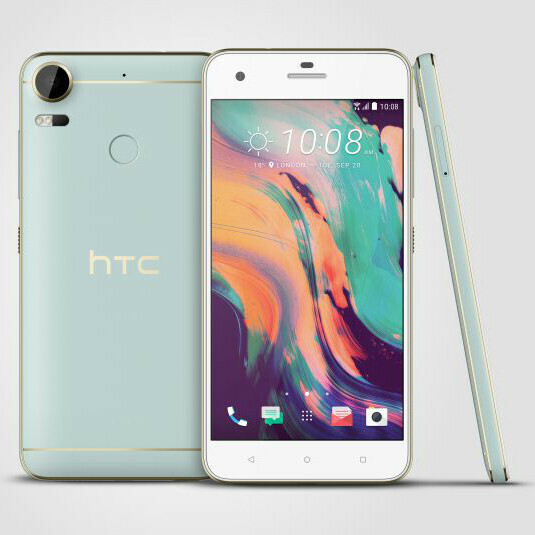 The HTC Desire 10 Lifestyle is the less-powerful in the duo, with a 1.6 GHz, quad-core Qualcomm Snapdragon 400 SoC under its hood, 2 GB or 3 GB of RAM, and 16 GB or 32 GB of storage under the hood, depending on which variant you pick up. The display has a hefty 5.5-inch diagonal, but a not-so-impressive resolution of 720 x 1080 pixels (267 PPI). The selfie camera has a 5 MP sensor with a F2.2 aperture, while the main snapper on the back is a 13 MP one, with the same F2.2 aperture. All of this is powered by a rather modest 2,700 mAh battery, though, it should do well when only powering a Snapdragon 400 and an HD display. 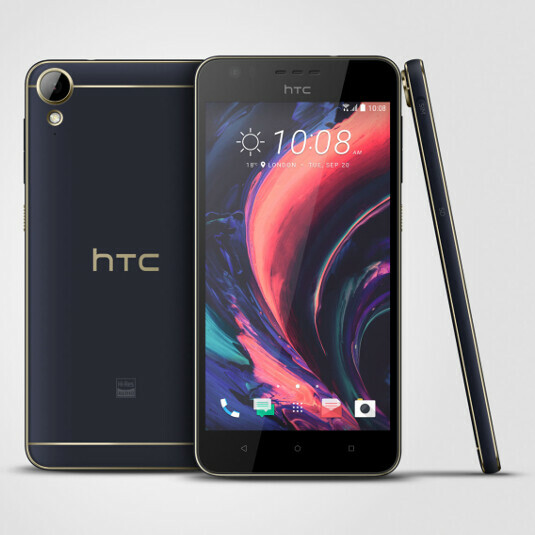 The interesting thing here is that the HTC Desire 10 Lifestyle, while being the lower-tier model of the two, still packs a 24-bit high-res audio chip and the BoomSound speakers, just like the full-blown flagship — HTC 10. The HTC Desire 10 Pro packs a bit more power under the hood, with an octa-core MediaTek Helio P10, 3 GB of 4 GB of RAM, and 32 GB or 64 GB of internal memory, dependent on variant. Its screen is still a 5.5-incher, but the resolution has been bumped up to 1080 x 1920 for a sharper image (400 PPI). The selfie camera gets upgraded to an impressive 13 MP shooter with F2.2 aperture, and the main camera is also boosted with a 20 MP sensor with F2.2 aperture, laser autofocus, and a dual-tone flash. The juice box here has a 3,000 mAh capacity. The Desire 10 Pro has better hardware all around but does not offer high-res audio for audiophiles. HTC doesn't have the habit of announcing prices before carriers and retailers do it themselves, and it seems the Desire 10 phones will be no exception. It seems they've been designed to be bang-for-the-buck devices that lean heavily on looks, but it remains to be seen how much they will set you back. Don't throw your money at the screen just yet, however, as it seems it might be about a month before the two devices hit store shelves in the US. HTC blows their price way off! And I'm sure these 2 will not be any different. I can relate to flagships but even the mid range and entry level are overpriced. And talking about that, they're using MTK processors which should even be cheaper! Why MTK and not SD ? They could definitely use SD 652, but no....they used MTK. More power to them, if people give MediaTek more business than maybe QC will get their heads out of their rears and up their game. i actually like the design.minus the big top and bottom bezel..that black and gold color combo is elegant...im thinking a black and red combo is good too. The design is very nice and great but they didn't mention that there is two variations of the desire 10, plus they didn't mention the hardware, and if the desire 10 lifestyle exist, will it pack a fingerprint scaner, or no? SD400? that should be on a $100 phone. It will most likely be from the 400 series and not the 400 itself. The SD400 has 32 bit processing and would make no sense being utilized with Marshmallow or Nougat. I would be surprised if the 400 soc is even still in production. Appearance wise it's way above entry level. SD400 in 2016/17?. Did HTC release 2013 phone now? Is it a re release? Oh crap, I want MOTO to have this design! Pricing is everything. Struggling company, you need the consumer, show them what your devices can do. They can't afford to price it more than $250. So 24 bit audio on the lifestyle and not the pro? 2013 low end cpu in a 2016 mid range device. Is anyone still wondering why is going downhill? What a s**tty company, trying to sell a midrange phone with totally s**tty specs to their loyal customers.